Can you find love in Love, Virginia? Is there wisdom in Wisdom, Montana? How about inspiration in Inspiration, Arizona? 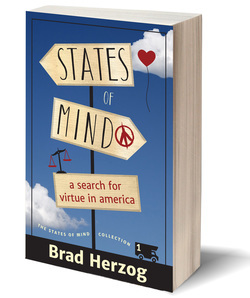 In the mid-1990s, Brad Herzog took stock of his increasingly cynical generation and wondered if that cynicism reflected the real America or merely misjudged it. So he and his new wife, Amy, decided to find out. They emptied their bank account, climbed into a Winnebago and hit the road on a 314-day, 48-state, life-changing excursion. What began as a literal search for the small places on the map became a figurative examination of the small places of the heart, a quest for virtues lost amid disillusionment. Like Robert Pirsig's Zen and the Art of Motorcycle Maintenance, STATES OF MIND is philosophical inquiry in the form of a compelling travelogue. It is the hamlet as allegory, the frequent historical detour as contemporary reminder. Every town, no matter how tiny, has a fascinating story to tell. Comfort (Texas) is the site of the only Union monument on Confederate soil. Truth or Consequences (New Mexico) is the nearest city to the Trinity Site where the first atomic bomb was tested. Hope (Mississippi) is only a few miles where civil rights workers Goodman, Schwerner and Chaney were infamously murdered in 1964. Triumph (Louisiana), near the end of the Mississippi River, is completely destroyed by a hurricane every two decades or so—and bravely rebuilt. The Herzogs sail along the Gulf of Maine outside the coastal village of Friendship with the Zuber family aboard their 1902 restored Friendship sloop. They take a tour of Pride (Alabama) in the pickup truck of "Chicken" Owen Foster—a 6-foot-8, 340-pound, cigar-chomping good ol' boy—and his one-eyed dog named “Dog.” They meet several residents of Justice (West Virginia), all of whom are direct descendants of the Hatfields and McCoys. STATES OF MIND begins in early January in Harmony (California), an artists' colony of 18 residents. It ends ten months later on Columbus Day in Joy (Illinois) with a hilarious-yet-poignant conversation with a boy found sitting alone in a city park on his seventh birthday. The journey in between is an excursion into the American scene and the American psyche. As John Steinbeck wrote, "One remains away just long enough to learn the lesson."